Having a sound retirement drawdown strategy and keeping to it is crucial if you want to be able to live comfortably in retirement and not spend time worrying about outliving your savings. Most of the financial services industry has been focused on helping people Accumulate or save & invest (and their business models are built on this). How to Decumulate or drawdown and generate retirement income tax efficiently is a complex topic that is starting to get more attention. In order to set your withdrawal plan you first need to know how much you’ll need and want. From a risk management perspective – try to get the “need to live on” amount as low as possible. Optimize Your Lifestyle & Expenses: Take a hard look at your expenses and find ways to get as efficient as possible – this is a huge driver of how much you need in retirement. Build a budget, go through all of your expenses – especially recurring expenses. Get rid of bad debt (credit card, car payments, student loans – ideally pay off your mortgage). Consider where you want to live, since that is a huge driver of taxes and expenses in retirement – here are some lower cost/higher quality of life places in the US – and here are some places to retire abroad. Budget for Out of Pocket Healthcare: Consider health care and insurance costs. Out of pocket healthcare costs for a 65 year old couple are more than double what the average household has saved. Read up on how Medicare and Medicare Supplemental Insurance work. There is an interesting movement around FIRE (Financial Independence Retirement Early) – the FIRE Community has some great lessons for traditional retirement people around being frugal/efficient and mindful. The reality is that for most people their expenses drop by ~ 10% per decade in retirement. The more income you have in retirement the less you need to draw down from your assets, so think carefully about this one. 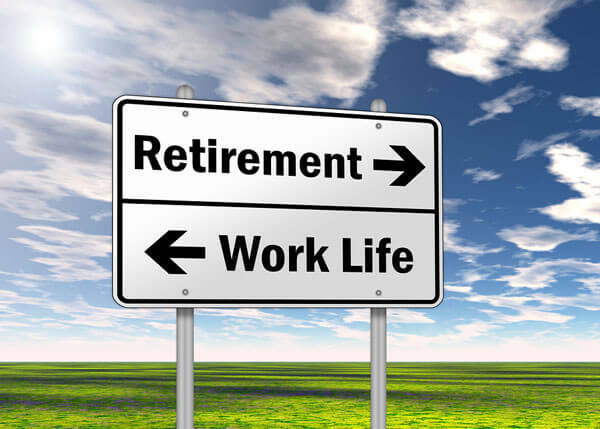 Factor in Part Time Work: When many people think of retirement they think “no more work” – the reality is that part time work is part of many people’s retirement – for income, for engagement, to give back or for social reasons. It can be a way of breaking down the problem of retirement income into smaller pieces – for example if you were making $100K a year and think you only need $75K in retirement, then Social Security ($25K) + Part time work ($25K) + Drawdown savings ($25K) sounds like a more achievable plan. Working part time also gives you a hedge if there’s a big market correction – you’ll give yourself more time for your investments to rebound and you might be able to dollar cost average into the lower market prices. Here are some ideas to find a new chapter for yourself by working in retirement. Maximize Social Security: Sounds obvious right? Recently more people have started getting smarter and are delaying the start of Social Security benefits. However, about 33% claim Social Security at 62 – which is generally a bad idea. Basically – if you think you’ll have a long life – then you should delay as long as possible since you’re effectively “buying” an inflation adjusted lifetime annuity backed by the US government at a lower rate than you could buy it on the private market. You can explore your breakeven age Social Security here. If you’re married – have the highest earner delay until 70 – here’s why. 21% of Married Couples and 43% of unmarried people rely on Social Security for 90% of their income. Here are 11 ideas on how to live on Social Security alone. Explore Income Generating Investments: Originally most equity investments were made with an eye towards how much income they would pay to the stock holder; today Dividend paying stocks (or ETFs or Mutual Funds) play that role along with Fixed Income (Bond/Debt) investments and increasingly more sophisticated investors are looking into Alternative Investments (“Alts” include private equity, hedge funds, managed futures, real estate, commodities and derivatives contracts). In an ideal world your investments generate enough income to cover your expenses, but very few people achieve that. Fixed Income Bonds might yield 1-7% annually – generally high quality debt with a shorter duration has very low yields these days (due to quantitative easing from central banks). If you want higher yields you’re taking more credit risk and holding it for longer. Alternative Investments – these have all kinds of returns and all kinds of risk and are generally restricted to institutional or accredited high net worth individual investors. Consider Whether You Want to Buy an Annuity: Annuities are contracts with insurance companies that allow you to “buy” guaranteed income – they can be purchased with Qualified or Non-qualified money. QLAC – Qualified Lifetime Annuity Contract – are growing in popularity – these allow you to use Qualified savings to buy an annuity for guaranteed income and as an added bonus they allow you to delay RMDs until 85. There are a lot of flavors of annuities and you need to be careful to make sure you buy one efficiently if you go down this path. See how much lifetime income you can buy with a lifetime annuity calculator. Many people have some other big levers that they could potentially pull which could significantly impact their retirement drawdown strategy, so it’s worth considering them before they execute their drawdown plan. Set your own planning timeline by buying Longevity insurance via a deferred annuity – this effectively lets you set a specific planning time horizon vs. having an open ended timeline. The basic idea is you buy an annuity today that doesn’t start until close to your expected mortality date – the cost is cheaper since the insurance company doesn’t think you’ll be around to collect. However if you are going strong you’ve got income for life. You can get an annuity estimate here if you want. Limit your withdrawals so that your portfolio will last a very long time – otherwise known as the “The 4% Rule”. Limiting withdrawals from your retirement account to be four percent annually in retirement age was thought of as a safe way to ensure you will not outlive your retirement savings. The concept of limiting your withdrawals has merit (the idea being you mainly draw from expected returns and not principle) , but realistically the “four percent rule” must be considered in conjunction with projected life expectancy, taxes and actual portfolio returns. Downsize – have property values increased since the time you moved to your current neighborhood? Connect with a residential real estate broker and have a conversation about downsizing, pocketing the equity your home has gained over the years and potentially slashing more than the cost of your mortgage but of utilities and expenses as well. Co-housing / renting out part of your home – if your home or property is large enough, you could rent out a room or portion your house to collect a steady flow of rental income. Rent out your entire home and move to a lower cost area or country. Consider getting a reverse mortgage with a line of credit or lifetime income stream of payments. Stay Healthy and Hedge Healthcare Risk: The main part of enjoying and getting the most out of your retirement is being healthy. Eat right, exercise, get enough sleep, don’t stress out, be mindful, stay social with your friends and get out for some nice long walks in the woods – preferably with your dog. Seriously if you’re health is compromised you’re much more likely to burn up your hard earned savings. Consider different ways to hedge the risk you’ll need Long Term Care – many people can self insure or buy an annuity or hybrid annuity/LTC product vs. pure long term care insurance which is being offered by fewer insurers each year. Step 1 – Understand how drawing assets from different kinds of account will impact the taxes you’ll need to pay when you draw down in retirement. There are essentially three places to hold your retirement savings which are covered below. Ideally prepare for your draw down by positioning your savings & investments into the appropriate accounts so they can can be drawn down tax efficiently. The reality for most people is that most of their savings are in Qualified Accounts. How this money is held goes to the next item – tax efficiently drawdowns of these assets. Pre-tax / Qualified (401K, IRA, HSA) – this is where most people have accumulated their savings since they were able to deduct it from their income when saving it. You save on income taxes now, but will pay income taxes (not lower long term capital gains taxes) when you draw it out later – the hope is that income taxes are lower in retirement (which may not be the case). Note – if you have a bunch of company stock in your 401K – then read this. Post Tax / Non-Qualified (normal savings/brokerage accounts) – some people that are good savers/investors have built up money here. You’ve already paid income taxes and you’ll only be subject to short or long term capital gains taxes (which are significantly lower than income taxes ex. 15% long term capital gains vs 25% income tax for married people making between $75K to $150K). Roth IRA – this is an IRA that is subject to the rules applying to a traditional IRA except it’s post tax money that is invested in a ROTH IRA where the savings grow tax free and are also not taxed when you withdraw the money. Note – ROTH’s are not simple, but if you can manage to get more of your money into the ROTH vehicle it can be worth it for you AND your heirs since it’s not subject to RMDs (Required Minimum Distributions) and it can be inherited. First – deplete assets that are already tax effected (Non-Qualified money above) since it buys you more time for your Qualified money to grow. Second – use tax deferred (Qualified money) since it allows your tax free (Roth) money to grow. Note your Qualified money will be subject RMDs after age 70 ½ – the IRS has required minimum distributions from Traditional IRAs and 401(k)s.
Third – use ROTH tax free money. Limit the amount of money you need to generate from selling Assets (see Expenses, Social Security and Part Time work above). Keep two-to-five years of retirement income in cash, or cash equivalents like TIPS (Treasury Inflation Protected Securities). Keep 25-50% of your retirement savings in a medium risk portfolio with a 5-10 year timeframe. Keep the remainder in a longer term higher risk higher return portfolio. Use some kind of low interest revolving credit facility that you can tap into and payback – for example a HELOC (Home Equity Line of Credit) or a HECM (Home Equity Conversion Mortgage aka a Reverse Mortgage) line of credit. It is always interesting to see how other people are planning. Here is my retirement drawdown strategy: I’m still under 50 and more on the accumulation side of things and also facing > 10 years of college tuition, but here’s how I look at our situation. Continue to monitor our spending and try to stay as efficient as practicable. Like many risk averse investors I’ve got too high a cash allocation, but I’m invested across a mix of Robo Advisor, Alts (Commercial Real Estate, Hedge Fund, Angel investments), Home equity, Business, Cash. Personally I expect a stock market correction at some point in the not too distant future given the business cycle, concentration of growth in certain sectors of the economy, demographics and the ending of quantitative easing. Continue to work hard to make NewRetirement all that it can be and thus more valuable. Continue to try to balance work & life & family & health. Continuous tax optimization as the tax regime evolves. Retirement planning and decumulation is complex and involves big sometimes long term decisions – it can pay to have experts in your corner to review your plan or to help you take action to get it implemented. I have a CPA to help me with taxes and sometimes talk with expert legal or financial advisors who act as a fiduciary. Today you can find experts who you can pay for a specific service if you need or want help. The NewRetirement Planner is a comprehensive online tool that enables you to model and document most of the ideas and strategies outlined here. It’s a great way to build a free DIY Retirement Plan that is personalized for your situation. Retirement Planning Made Easy: Use the NewRetirement planner to find your path to the future you want!